Ever since I was little, I’ve been obsessed with decorating my room. For a long period of time, my dream job was to become an interior designer (not really anymore), but I’m still obsessed with styling up spaces. When Juniqe got in touch asking if I would like to choose a few pieces from their site, I jumped at the chance as they have some lovely homeware/stationery bits. Although I am under no obligation to create a post including these products, I thought I would as I’m obsessed with it all and wanna share the love for Juniqe. 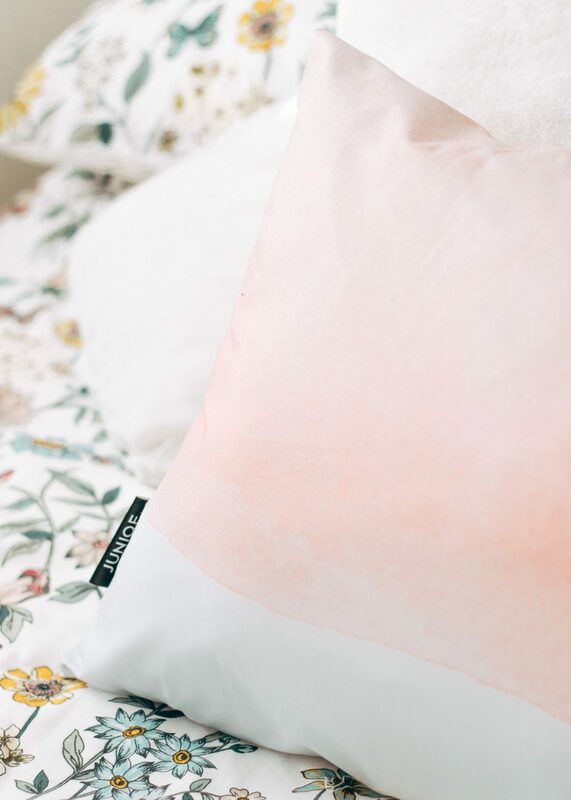 Juniqe is a Berlin based brand that started up in 2014, they stock homeware bits such as cushions, duvets sets, blankets and prints. Also a few stationery bits like notebooks, planners, postcards etc. So basically, right up my street. So, the first thing I spotted and popped into my basket was this gorgeous mug. There are so many pretty designs, it was hard to choose, but I really liked this pattern and its my kind of colours. Perfect for your morning cuppa! I had a scroll through their prints and wow, there is a huge selection. I have a large print that sits above my bed already, that I’m pretty happy with so I decided to opt for a smaller one to hang up or place on a shelf. 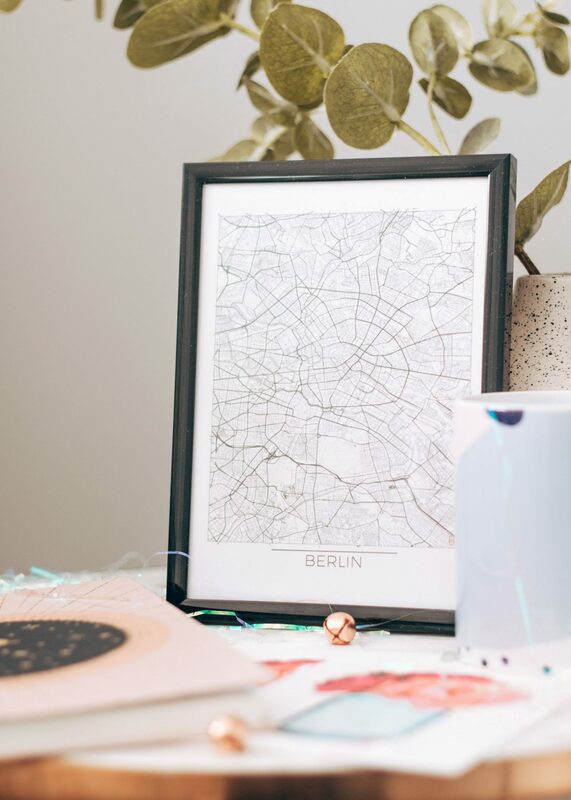 Last year, I travelled to Berlin and it holds a special place in my heart, so this print seemed like a great option. I also chose to have it framed as well. I love the plain black frame, it works so well with the black and white print. I then had a look at what cushions they had to offer, as I’ve been looking for a new one to place on my bed. I spotted this simple design, I love the watercolour pink wash, its so unique. I must admit, its a lot bigger than I thought it was going to be (I probably should have checked the measurements), so make sure you have a look at that before buying haha! But it looks lovely and is actually very comfy to rest on too. I then went back to the stationery section (I’m a sucker for it), to see if anything else took my fancy. Although I certainly don’t need another notebook, I couldn’t help myself when I saw this super cute design. I love anything space related, oh and its pink – even better. What I love about their notebooks as well, is you can choose whether you have the pages plain, lined or dotted. I went for dotted as I want to try and start bullet journalling again, perhaps once university is over for the year though. I then saw they stocked postcards, and if you follow me on Instagram, then you’ll probably know I have a few pen pal’s. I collect postcards where I can to send out to them, so this was a great opportunity to add to my collection. The design I went for, was this bouquet of flowers in a little mason jar. Honestly, you could frame this and it would look super cute on your wall too. But yeah, I love them and hopefully my pen pal’s will too. 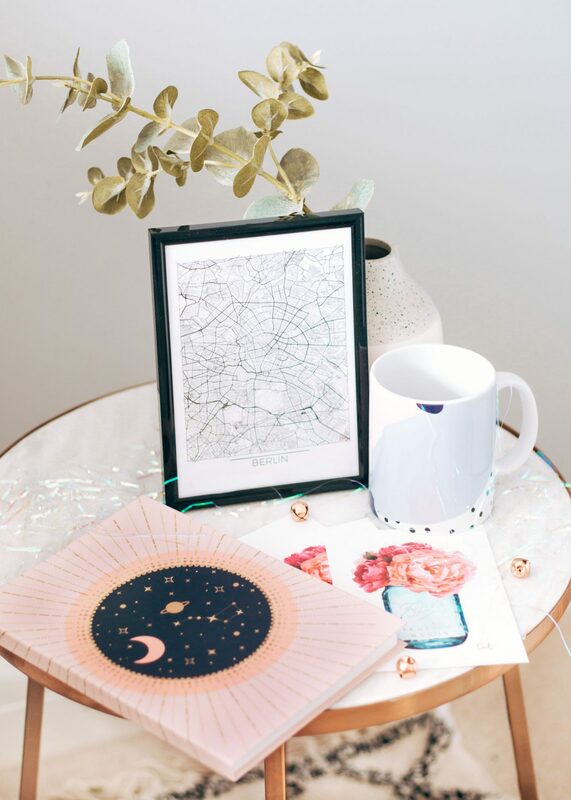 If you’re a bit of a homeware/stationery fanatic like me, I’d highly recommend having a browse of Juniqe – so many pretty pieces! I also have a 20% discount code, ‘FOREVERSEPTEMBER<3’ which gives you 20% off site-wide. The minimum order value is £29 and it will end on Sunday 31st March. Happy shopping!